Morris notes, “It often seems every public discussion about our most used and visible biofuel, ethanol, starts, and sometimes ends, with the question, ‘Doesn’t it take more energy to make ethanol than is contained in the ethanol? '” In 1980, the short and empirical answer to this question was yes. In 1990, because of improved efficiencies by both farmer and ethanol manufacturer, the answer was, probably not. In 2005 the answer is clearly no. 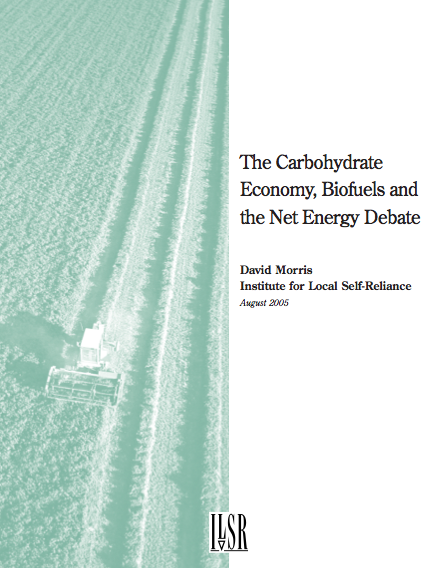 The new report focuses on the energy balance of biofuels production. In doing so, it inevitably focuses largely on the studies of David Pimentel, who has been ethanol’s most visible critic. Reporters and interested parties who want to examine the numbers and report on or participate in the debate might take into account six key points. David Pimentel’s pessimism about biofuels derives from a methodological approach that leads him to a far more sweeping and highly controversial conclusion: the world’s population has vastly exceeded its biological carrying capacity. Although an enormous amount of attention has been focused on the debate about the energetics of corn to ethanol, the differences actually have narrowed to the point that they are relatively modest. On the other hand, Pimentel and Patzek’s new estimates of the energy balance of making ethanol from cellulose and biodiesel from oil seeds diverge dramatically from those of other studies. All other studies done after 1992, except for Pimentel and Patzek’s have found a positive energy balance of corn to ethanol. Of the sources Pimentel and Patzek cite in support of their conclusion, only one was an actual scientific study. Those who do take the time to review the various reports will discover that only a handful of factors account for over 80 percent of the variations among net energy studies of ethanol. “Many of us believe that biological sources can play an important, perhaps even a crucial role in our future economies. But moving in this direction will require tackling fundamental questions, such as the ownership structure of the agricultural industry and world trade negotiations,” said Morris. “We can’t tackle these fundamental questions if we continue to spend an inordinate amount of time and intellectual resources poring over net energy studies,” he added.